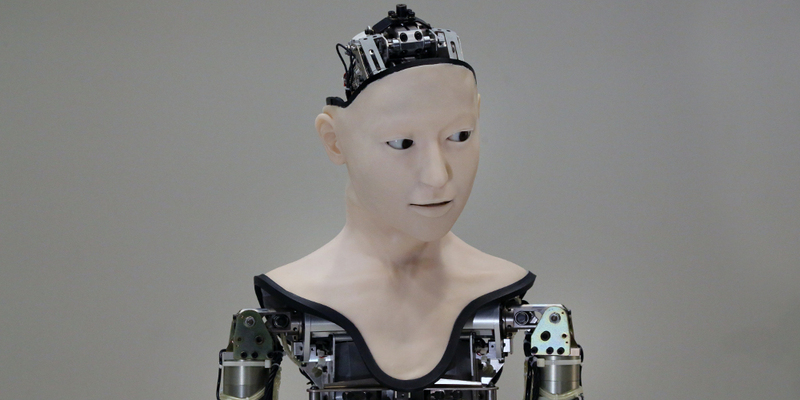 Alter is a robot developed for the purpose of exploring what it means to be “life-like.” Alter appears to be a machine that has been stripped bare. However, it expresses life-likeness through complex movements. These movements may look haphazard, but change constantly due to the underlying algorithm that mimics the logic of neural circuits of living things. A moment of “life-likeness” emerges as you observe closely—what is that moment like? Attempt to find your own answer to that question. Alter does not move in ways that are determined beforehand; rather, the movements made by the entire body are created in real-time. Furthermore, your responses are perceived by sensors and reflected into the movements. A central pattern generator (CPG) creates a basic rhythm that is cyclical, yet which gradually deviates from the original pattern. A neural network of 1,000 nerve cells is recreated on the computer, and Alter learns “life-like” activities based on signals sent from the sensors. Itsuki Doi (JP) is a sound artist and a PhD candidate at the University of Tokyo, Graduate School of Art and Science, where he also received his Master Degree of Science in 2015. Takashi Ikegami (JP) is a professor at the University of Tokyo. He specializes in artificial life and complexity, and has been known to engage on the border between art and science. Hiroshi Ishiguro (JP) received a D.Eng. in systems engineering from the Osaka University in 1991. He is currently Professor at the Department of Systems Innovation in the Graduate School of Engineering Science, Osaka University, and Distinguished Professor of Osaka University. He is also visiting director (group leader: 2002-2013) of Hiroshi Ishiguro Laboratories at the Advanced Telecommunications Research Institute and an ATR fellow. His research interests include distributed sensor systems, interactive robotics, and android science. Kohei Ogawa (JP) is a robotics and Al researcher at Osaka University, where he has been an Associate Professor since 2017. He is working on a robotics and interaction study.